A Staff refers to a member of your organization that plays a vital role in your business. The '+' icon on the bottom left corner of the screen lets you add a staff in one click anywhere in the Geo console. Clicking the ‘+’ icon would show the ’Staff’ icon you must choose to add a new member. A staff card opens where staff details can be entered. 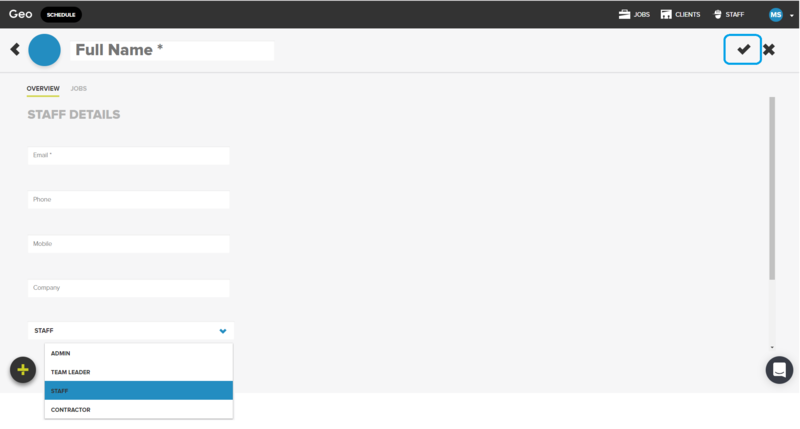 Down the bottom of the staff details, a Staff Role must be chosen in the drop down menu. For details on Staff Roles, open the article on: How do Staff Roles work? To save the staff details, hit on '✓' on the uppermost right corner of the screen. The staff then receives an invite on their email address where they can accept an invitation to join Geo to log-in to Geo Console and iOS/Android App.